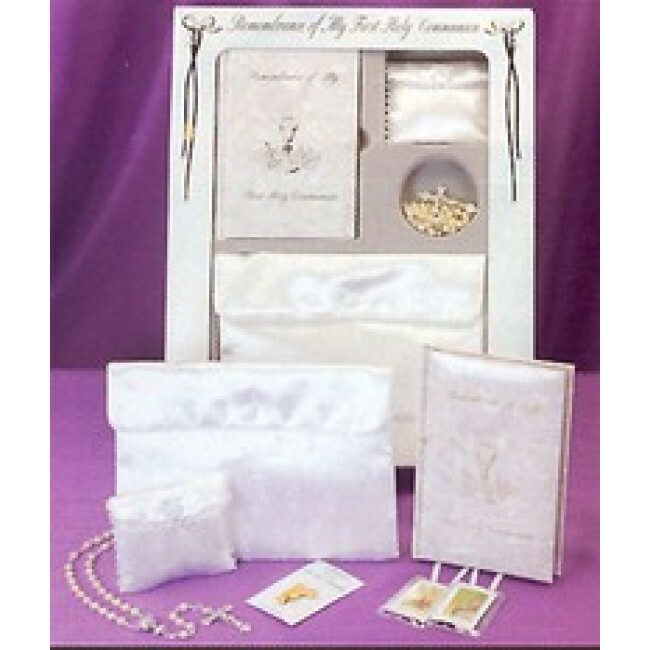 This deluxe First Communion boxed gift set features a gift edition of the Marian children's mass book with a gold stamped, padded pearlized cover with gold edges. The girl's set contains the book in white, a satin brocade purse with shoulder strap, matching satin rosary case with pearl rosary, a brown scapular and gold Communion pin. The boy's set contains the same book in black, imitation leather wallet, to hold the book, squeeze top black rosary case with black rosary, brown scapular and gold Communion pin. Both come in attractive gift box.